“You are My witnesses,” says the Lord ( Isaiah 43:10). When the Divine revelation speaks to us, there is always Godly aspects to the speech. It is not to the whole world that He says you are my witnesses. For the world testify to its chief satan, who has been killing people since the beginning. But we, who believe in the Son of God, Who was incarnate, died and resurrected for us in obedience to the love of God the Father, and through the work of His Holy Spirit, who He sent from the Father to be in us, taking from the Father and telling us who believe, sending us as witnesses for Him in this dark world. Yes, we are the ones who believed in Him, baptized and united with the mystery of His love in the Eucharistia by receiving His body and His holy blood. We are called up to be witnesses for Him in front of all creation. In fact, every true Christian is a witness to the Lord in his life and Christian behavior, his words, recognition of his living faith in our redeemer and Savior Jesus Christ, the Son of the Living God. Testifying with the good speech ” Let your speech always be with grace, seasoned with salt, that you may know how you ought to answer each one” ( Colossians 4:6). I, as a Christian, do not say any defects from the mouth through which I confess, praise and bless the Lord, and with which I receive His holy body and blood” Let no corrupt word proceed out of your mouth, but what is good for necessary ediﬁcation, that it may impart grace to the hearers” ( Ephesians 4:29). We witness through good works and behavior with everyone without discrimination according to the commandment of our Lord, and be the light amid the darkness of this age” Let your light so shine before men, that they may see your good works and glorify your Father in heaven”( Matthew 5:16). Then we witness to the divine love that is poured into our hearts by the Holy Spirit toward every human being, even the enemies” But I say to you, love your enemies, bless those who curse you, do good to those who hate you, and pray for those who spitefully use you and persecute you, that you may be sons of your Father in heaven; for He makes His sun rise on the evil and on the good, and sends rain on the just and on the unjust” ( Matthew 5:44-45). Believe me, my brethren, that love is stronger than death, because God is love. We also witness to the power of the Holy Spirit in us, Who we have received in baptism and the mystery of the holy Meyroun. This gives His children the power to be witnesses and to even die and become martyrs instead of renouncing their faith in Christ, revealing the spiritual strength to speak out the truth that is in them, that Jesus Christ is the living God” Therefore I make known to you that no one speaking by the Spirit of God calls Jesus accursed, and no one can say that Jesus is Lord except by the Holy Spirit” ( 1 Corinthians 12:3). Maybe we have witnessed and are witnessing the power of martyrdom of the children, women and men after declaring their faith in the Lord Jesus Christ, who shed His blood for them and us. They did not hesitate to offer their blood cheaply to testify to Him who has given Himself up for them. 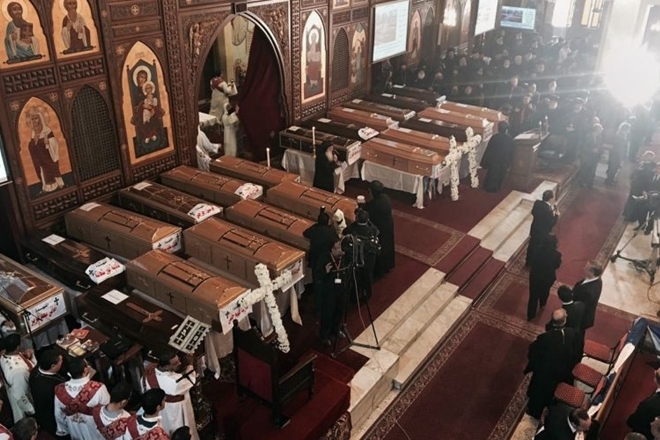 To the martyrs of our modern era in upper Egypt, Libya, Saint Peter’s Cathedral, Saint George in Tanta, Saint Mark in Alexandria and in every spot on our precious land of Egypt, we send our peace, greetings and love to your precious blood, which was sanctiﬁed by your faith and love to Christ the King. Your blood that was shed was the greatest testimony before the whole world on television screens and on the Internet. Yes, we have preached a lot and spoke more, so we could scarcely draw even a few souls to the path of faith and repentance, yet you with divine power and in few minutes were able to harvest thousands of souls from all nations, tribes and peoples. How great is your testimony, heroes of faith!! The Holy Spirit worked in you as He worked in the apostles and Peter on the day of Pentecost. In few minutes and with few words out of Peter’s mouth, he drew three thousand souls to the Lord. Truly, the words of the scriptures were fulﬁlled in you” You are My witnesses,” says the Lord” ( Isaiah 43:10). The word says the Lord is a personal signature on what He speaks. Hence, it becomes attributed to God’s power and divinity. He accompanies by His Holy Spirit those who testify and witness to Him by preaching, following His commandments and even dying for His name. Look at saint Stephen the head of deacons, how after his testimony before the Jews about Christ, that they were angry in their hearts, stoning him to death. He saw the Lord Himself because He was accompanying him on his journey of testimony and martyrdom” But he, being full of the Holy Spirit, gazed into heaven and saw the glory of God, and Jesus standing at the right hand of God, and said, “Look! I see the heavens opened and the Son of Man standing at the right hand of God!” ( Acts 7:55-56). They stoned him, and he was asking for their forgiveness as His master did on the cross” And they stoned Stephen as he was calling on God and saying, “Lord Jesus, receive my spirit.” Then he knelt down and cried out with a loud voice, “Lord, do not charge them with this sin.” And when he had said this, he fell asleep” ( Acts 7:59-60). Listen to the Lord one more time” You are My witnesses,” says the Lord, And My servant whom I have chosen, That you may know and believe Me, And understand that I am He. Before Me there was no God formed, Nor shall there be after Me” ( Isaiah 43:10). Listen to Him also saying” I am the Lord, who makes all things, Who stretches out the heavens all alone, Who spreads abroad the earth by Myself” ( Isaiah 44:24).